When purchasing a second hand tonarm make sure that all weights (not all arms use them though) and springs come with the arm, finding a replacement can be difficult especially if the company is no longer with us. For information on arms currently in production please take a look at the Tonearms page. 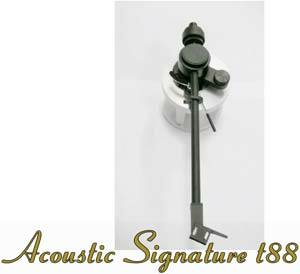 Sold the Lustre arm during the70's and 80's that was actually a , that is said to be fairly good and also supplied a simpler arm to other manufacturers as an OEM, the Rega RB-200 was made by ACOS amongst others. Sold the T88 from 2006 to 2008 which is a fairly inexpencive model that appears to be sourced from Jelco, this features a straight armtube and a fixed headshell but in in other terms similar to other such OEM Jelco models. It was also supplied with some of the cheaper turntable models from the company as a standard arm but has since been replaced with a Rega derived arm. Started making the Model 1 in the latter half of the 80's and it proved to be quite popular for such an expensive design but for some unknown reason very seldom seen on the second hand market, while arms that were in a similar market segment at the time like the Goldmund are fairly common. From what I gather the arms can be upgraded to the current 1-D specification, you can read a review of the original model by Stereophile here. Made the HR100S and HR100s MCS arms in the late 80's early 90's, it's a medium compliance unit featuring a ultra rigid design machined from titanium right from the bearing to headshell as a one piece, features a ceramic gimbal bearings and was designed by Mike Knowles, the Xenon was a slightly cheaper version of the HR100 with standard bearings, cheaper internal wireing and a black rather than metallic coloured base but otherwise identical to the more expensive model. They also had a slightly more inexpensive models that we have no info on called Opal and Delta that also used the same basic design but were made using inferiour materials. (The HR100S was price wise similar in price to the cheaper SME's at around 500 £ or so in the early 90's). Note that the Alphason arm was designed to drop into a linn armboard and had the same effective length. Made simple unipivot tonearms in 12" and 16" sizes for transcription turntables in the 50's early 60's, those models are borderline on being suitable for use in modern equipment (with those vintage buffs you just never know). Unusual in their day by having a replaceable headshell. One of those Japanese audio engineering companies that have been making quality arms mostly for the home market. The predecessors to the current 4400 and 3300 were the 4000 (12") and 3000 (9"), while structurally similar to the current versions they are not as configurable and were of an inferior build (not bad mind you, it's just that the current ones are stunning) so you should pay significantly less for those than for the current models. Apart from more conventional arms the company has also released a unipivot or 2 like the oil-damped AC-300 Mk 1 & 2. While the arms that the company currently makes are in the middle section of the market earlier models from the company such as the PT-5 and earlier were strictly entry level models and you should take that into account when buying and pricing, even though they look similar to the current models. Has recently discontinued the PT-6, 7 & 8 these were equivalent (and broadly similar) to the current PT-9, PT-9 Plus and PT-9 Extreme (i.e. all the same arm but the cabling differs) and around US$100 cheaper each so you might want to see if you local stockist sill has one. Taking a closer look ar at the PT-5 and PT-9 it appears that these are manufactured for Audiocraft by Jelco. Has made quite a variety of tonearms over the years but we only have information on a few of them. The AT-1007 is a medium mass 9" S shaped arm dating (I believe) from the 70's, it came with 2 counterweights and 2 matching anti-skating weights and a detachable headshell, if considering a second hand purchase make sure all 4 weights come with the arm else you will have a very limited choice of carts to use with it. The AT-1010 is a well regarded later design that features an oil damped lifter and was often sold with the cheaper Technics turntable bases like the SP25 and as such is fairly common, at any rate the one that shows up most often for sale. There was also the ATP-12 a 9" arm while the 12" variant used the ATP-12T name the 16" vatiant was called ATP-16T. There is also the AT-1501 and the AT-1503 that were produced for quite some time as it made ut up-to Mk III in the late 70's, but I have no further info on them except that they are supposed to be fairly good (this may be one of the arms made by Audiocraft for AT) and the more budget AT-1100. The company now has data on most of their tonearms available on their homepage in the form of PDF formatted scans of instruction sheets and sometimes engineering sheets as well but only in Japanese at the moment. Information wanted on those arms (Pantograph etc). The original superarm, introduced in the 70's this was the first arm to feature military spec bearings and to make a SME ltd. arm appear to be reasonably priced... The Model 8 has been made since the 80's mostly unchanged and the only outward difference is that early models have a silver coloured armtube but the current models have a black one. Arms that the company sold with their kit turntables and also separately. Further info would be appreciated. The International was one of those early unipivots, had optional damping and no lifting mechanism so perhaps best used on a Thorens and with a low compliance cart, but nevertheless much beloved by the Germans for use with some MM pickups (I am beginning to understand why so many suppliers over there offer mid priced models with multiarm capability). The International was originally introduced in the late 60's and a updated version was released in the late 70's but I have not been able to get any info on the differences, but the arm can sound lovely esp. with an old Decca cart but shows its age when it comes to tracking and has a tendency to jump. Need more info on the Deram. The Mark 1, Mark 1 Super, the FFSS and FFSS Professional can only be used with vintage Decca carts are best left to the vintage buffs, there were adapters made to enable the use of those arms with standard pickups but those are rare. All the arms from this company are high mass arms (at or over 1kg) that can be tricky to set up on a suspended turntable or a very light one, but very nice once you get it right. The earliest model was the DV-505 introduced in 1976 to much acclaim at the time, and discontinued in the mid 80's with the introduction of the 507 and is broadly similar to the current model but note that the 505 was considerably cheaper than the 507 so there are more of them about and they usually go much cheaper second-hand, so for an introduction to the Dynavector Clan you cannot go wrong with a 505, also note that the 505 did not come with an arm lifter, that was an optional item (DV-3A) but I gather that you can still get that lifter from the manufacturer or something compatible. The DV-501 model was introduced in 1982, it's lighter, stiffer and simpler than the 505 or 507 models and does not use the spring loaded VTF and Antiskate system that the other have, to some the 501 is the best of the bunch. And nota bene you can download the manuals for the 501 and the 505 from the company in a PDF format.